Library of this institution was established in the year 1986 with a little stock but tremendous aspirations. Over the period of a couple of decades library successfully turned into a spacious reservoir of knowledge with untiring efforts of the guardians of this institution. 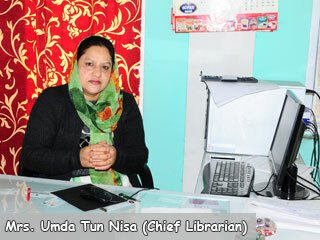 Library department is the heart of any institution so is true with this institution. Central library of Govt. Dental college is located in the centre of the campus and is easily accessible to everyone who is in search of knowledge. It is a spacious section which comprises of a reception counter at the main entrance where anyone visiting the library can keep their respective belongings in the safe custody of the staff member assigned the job of sitting at the counter and side by side maintaining the entry register of visitors on daily basis. Besides the reception counter is the Chief Librarian’s office/chamber, with one more room for library staff, one photographic section, one Xerox facility section and an artist cabin as well. Besides the rooms for staff there are two big reading rooms/halls to cater to the needs of UG’s and PG’s respectively. Along with two reading rooms are two document/information sections for books/cds and journals respectively. Last but not the least is the most important section that is the internet access section, which is most important as for as latest and updated information is concerned. We also possess video cassettes, and other multimedia gadgets. The central library has a big collection of books/cds and journals both national and international, the procurement of which is done by the library committee, which takes care of the demands of every department. The library committee is headed by the worthy Chairman/Principal and its members are from various departments and the Chief Librarian as well. The reading stuff is related to the field of dentistry and library committee takes care of quality rather than quantity so that every topic or title related or helpful to the clientele is procured and made available for use. The ultimate aim of every library is letting its holdings be used in the best possible way. The central library of GDC/H tries to fulfill this aim in every possible way. The organization of library is done in a manner helpful to every visitor, documents are classified and catalogued to help the inquisitive minds in quenching their thirst of knowledge. As such it is the ultimate task to make knowledge accessible easily. The staff in this regard work with their heart and soul to fulfill this aim and satisfy the thirst of anyone in the search of knowledge. The staff finds it a natural instinct that helping the clientele is the only way of satisfying their own souls. The aim of library is to provide easy access to material and information sources which will help everyone with their studies and research and this aim is fulfilled to its best but still there is a long way to go as far as development /automation is concerned. Circulation/Borrowing, users are allowed to take information sources at demand whenever one needs. The users are entitled to borrow books on all working days from 9:AM to 5:PM. Information source reservation facility is also given whereby users can resrve the information source of their need and borrow it when it is available in the library. Library provides both long range and short range services to its clientele wherby the users have a choice of borrowing the books for two weeks or use it within the campus and return it the same day. Printing facility is being provided for users, students as well as staff. The user can get a hard copy of the material of his/her use. Xerox facility is provided to users through which they not only get the photocopy of rare/reference sources or those materials which are not allowed for borrowing but also can get Xerox of their study notes or journal articles. In technical services collection development or acquisition is done professionally. In addition information sources are classified and catalogued in simplest and standardized way so that users can access the material of their need without the help of staff as such. Reference services are provided by staff to help users get information in a time saving manner. Efficient and dedicated staff is all time ready to help users in best possible and friendly way. Internet facility is provided to clientele whereby they can get access to worldwide updated, shared and new and rare research and development in their respective fields of knowledge. Photographic facility is provided to users for clicking rare photographs of books and dental surgeries done in the college itself. Moreover, photographs of seminars and functions related to dentistry are also clicked and reserved as a treasure. Artistic facility is also provided to fulfill artistic demands of users. As such every facility is provided by the staff with a smile to fulfill every possible need of the users. Library keeps on organizing events every now and then .In this regard the latest one is the book exhibition that was recently organized in the college auditorium by library committee in coordination with purchase section of the college. In this exhibition a number of publishers/suppliers participated with zeal and enthusiasm and exhibited their information sources related to the field of dentistry. Students and staff took part in the exhibition with great avidity and purchased books on spot at a huge discount as per the terms already discussed by the library committee with publishers/suppliers.